A Russian devotee, Alexander, had been to see Sathya Sai Baba and when he returned he excitedly told all his friends about the phenomenal occurrences that were going on in Puttaparthi, India. He told them an Avatar was on the Earth and discussed many of the details of his visit with them. But all listened mildly and had no interest in finding out anything further about this. He started to plan a return trip and wanted to take at least one other person with him. He had previously given several book in Russian to his friend "Mikhail", but Mikhail would not read them. Although the two had been friends since they were students and Mikhail knew his friend was credible, still he had no interest in Sai Baba. Alexander could not understand this as Mikhail was a well educated man, a professor and well known scientist with many achievements to his name. Alexander had resigned himself to going alone back to India, but unexpectedly, Mikhail had called and told him he had decided to go. He had told his wife that he might stop drinking if he went and so he got her support. He thought he might pay for the trip by the savings from refraining from alcohol for six months. Alexander explained to him that no one was allowed to have meat or alcohol or tobacco in Prasanthi Nilayam and Mikhail agreed to these conditions. But, even though he had decided to go, Mikhail still refused to read any of the books about Sai Baba. They arrived at the Ashram and were given a room to share with other international visitors. On the third day Alexander gave his friend three issues of the quarterly magazine, "Divine Love" and Mikhail started reading only those articles where Swami himself speaks. He was transfixed by what he read and continued reading into the night. The next day, Alexander got up to attend darshan as usual but did not see his friend Mikhail so he saved a place for him in the darshan lines even though the Seva Dal volunteer told him this was usually not allowed. Finally, a half hour before darshan time, Mikhail showed up and joined Alexander and they settled down to wait for a glimpse of Swami. At last he appeared and slowly, gracefully floated through the crowds until he approached to where the two Russian visitors were. 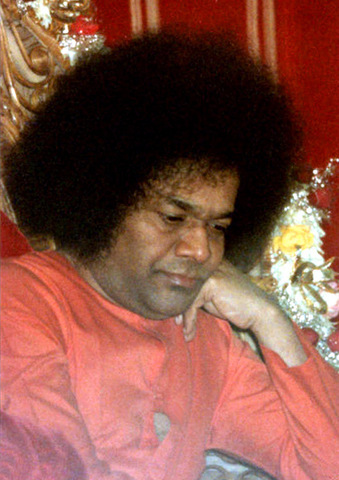 As he went by them, Sai Baba looked directly at Alexander and Mikhail and made a sign with his hands three times. Alexander was thrilled as it is an unusual occurrence to receive some kind of sign or attention from Swami. After Darshan, Mikhail excitedly told his friend Alexander that last night he had had a dream in which Swami came to him and had a long conversation with him. Mikhail was confused because the dream had seemed completely real to him and he could see and remember everything just as when he was awake so he didn't know whether to take it as a dream or a real event that actually happened. Then Mikhail narrated to his friend from memory, the following conversation from his "dream". In the dream he found himself in the very same lecture hall in Russia where he normally delivers lectures to his students. But instead, Swami was at the rostrum where Mikhail usually lectures and Mikhail was sitting at a table like one of the students. Sai: "You wanted an interview - you will have it now. You always liked double lectures (two 45 minute periods without a break): you will now have such a period yourself. You may ask me any questions." Mikhail: "Not everything is clear in religions. They divide"
Sai: "Religions were written for the time when people were primitive and so they were expounded in the language and concepts of that period. A blind belief and miracles were required. Look at Moses who was taking Jews from Egypt showing miracles. Each time requires its form. Temples were constructed but the real temple must be in one's soul. You did not want to read books about me, but you studied mathematics: first 2 X 2, then further, then physics. From the simple to the complex, but all the knowledge is held up by the highest knowledge which is God. Gradually one goes from intellect to spirituality; one needs intellect to live in the world. You started reading about me for the sake of your friend. Your friend is my channel. He brought you here and did it selflessly. Do not worry about material things - You have a good intellect. Just imagine that man's life in a cosmic scale lasts only one hundredth part of a second, so what difference does it make where you live: in a palace or in a hut?" Mikhail: Where can I find strength? Sai: "If you have spiritual strength, then physical strength is not important. Your program was to go swimming in the sea (this is exactly what Mikhail and Alexander had agreed upon). Go or you will be sorry. One must do everything sincerely, nothing should be done out of compulsion. You have a good intellect and it's not necessary for you to stay here long. You have to decide." Mikhail: "How shall I live now? Maybe I should become a monk or work out an algorithm for my future actions?" Sai: "If you put bread into the mouth of a hungry man then he will never learn to earn it himself. One can't work out algorithms for the whole of one's future. That is why you are given a choice in your life. I give you a trial and watch what choice you will take. on that depends whether you pass your test or not. If there was no choice, you would be slaves, and I don't need slaves. You should find a spiritual path by yourself, everything depends on you. You should not expect any gratitude for whatever you give." Mikhail: "What concrete steps should I take to come to spirituality?" Sai: "Let us take an example of water - it is a substance. One may pour it into a vessel; they may bring it to you in a restaurant in a crystal glass or you may pour it into a gold goblet. But the best of all is to go to the source, the spring, and drink it from there. The spring is in your heart. it is forgotten; you must yourself converse with God. What should you do? You must gradually change yourself morally for the better. You have bad habits. Start with getting rid of them. You have already become better; less proud. Pride is making you blind. Alcohol dries up your brain - that is the worst. It's an obstacle to God. Smoking dries up your body. It hinders your development." Sai: "Act according to the criteria of Truth. One can clean the puss out of the wounds like Mother Teresa or help people, but if you are proud then everything is in vain. If you want you may bring people the knowledge about me, but do not be a lecturer. Nothing should be done without sincerity, one should not be lazy. Your wife is more spiritual than you, she is more compassionate. Both of you still have an opportunity to come to me - your life span is not finished yet." Mikhail: "I can't understand: is it a dream or not? I am waiting with my group for an interview." Sai: "The cleverer a man is, the less faith he has. There are no miracles in the world, only a level of knowledge. For you to believe, tomorrow morning at Darshan I'll make this sign by moving my hand three times like that (and Swami showed how he would do it). That's the end of your double time." And after the dream ended, Mikhail attended darshan where Swami confirmed the truth of the meeting by making the sign with his hand three times. He has repeatedly said that no one can see him in a dream without his willing it. He chose this extraordinary way to help Mikhail in his spiritual growth at just the right moment in his life. As always he showers his love on all. From the March 1998 issue of Sanathani Sarathi. Published by Sathya Sai Books and Publications Trust.